of spoiling your children are actually more serious than you trying to not make your child sad. 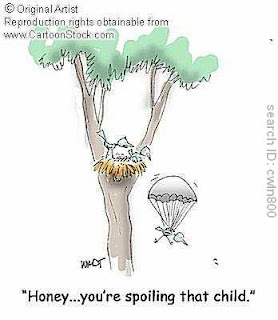 Some experts say that spoiling your children can lead to your children not learning how to solve their own problems. Other effects of spoiling children are just as dire, Children who are spoiled are too overly dependent on their parents, Children who are spoiled find it difficult to make themselves happy as adults. Researchers conducted a study that cited college students who were spoiled as children tended to say that being alone make them unhappy and that their source of happiness is other people, rather than themselves ("Extroverted"). Children who are spoiled find it harder to be responsible in life. According to research, Children who are spoiled don't understand the concept of boundaries as adults and are prone to have problems such as gambling, spending, and drinking. Lacking in emotional maturity, These children often become lazy and angry which turns them into unhappy adults. Because they have not learned relationships that involve both give and take, They often don't have the ability to make and keep friendships. A study shows that spoiled children are insensitive to other people, Are prone to temper tantrums and have trouble deferring gratification.